Pay it Forward is one of our favourite movies. If you haven’t seen it, the story is about a young boy, Trevor, who is given a class assignment to propose an idea that could change the world. Trevor comes up with a plan to help three people in a life changing way. In return, those three people are asked to help three people themselves, thus beginning a chain reaction of good deeds. He sees it through, and a movement is begun. The concept of passing on good deeds instead of paying them back goes back much further than the movie, and can be found as far back as ancient Greece. It’s a beautiful idea that many people try to incorporate into their lives, but it is usually limited to simply doing something kind, as opposed to changing someone’s life (which, don’t get me wrong, is a legitimate and wonderful way to live positively). The concept is also highly effective when it comes to cooperation and development. In Humana People to People projects, we use it to not only change lives, but also ensure sustainability and make each dollar go that little bit further. In many of our Child Aid projects, animals are provided as pass-on loans to selected community members, who are also educated in animal husbandry. The pass-on part means that instead of paying back the cost of the livestock and training, those who receive the loans must commit to breed the animals, and pass on offspring and basic knowledge to their fellow villagers. This simple action changes people’s lives. It provides them with a source of food, future income, and a sense of stability. And it benefits the entire community. 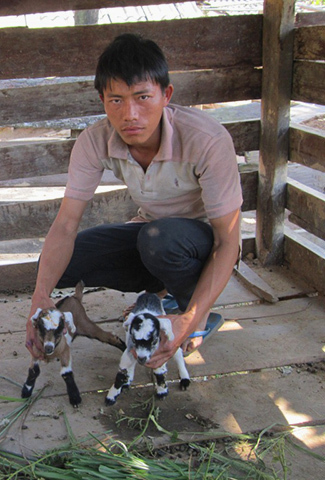 Child Aid Laos is using the Pay it Forward concept with goats, as well as mango trees. In the coming years, 600 mango seedlings are expected to result in two trees for every family across the project (eight villages in total). 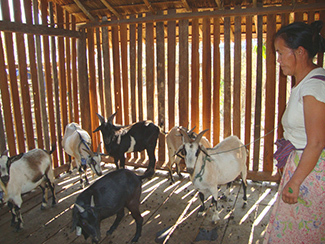 Earlier this year, 10 families across two villagers were loaned five female goats each, which are bred with four male goats. The 10 families have committed to give away all female kids that the nannies give birth to for the first three years, before they begin to sell or consume the offspring for their own use. All goats and kids in the program are vaccinated. So far, 48 kids have been born, which will be given to new families when they are around three months old. The process will repeat itself over the next three years, with the objective of providing at minimum of 30 families with 5 female goats each to breed with. This small idea will have a huge impact on these 30 families, who will be able to use offspring to eat and also sell. 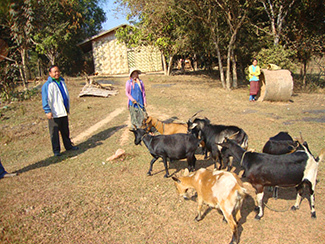 Goat meat is very valuable in Laos and in neighbouring Vietnam, and will provide these families with a regular source of income as well as food security. The idea of passing on or sharing benefits permeates the project with more than animals and fruit trees. Communities taking part in Humana initiatives fundamentally understand that our best chance of collective progress lies in helping each other. Farming cooperatives are formed to share knowledge and practices. Savings groups are created to help one person at a time get a foot ahead. Wells, latrines, even school buildings are constructed one village at a time, with the wider community taking part in each small development. Improvements can be as “small” as a family building a latrine and having a fixed and sanitary place to go to the toilet, or as “large” as seeing a 70% increase in the amount of women who use maternal and early childhood healthcare services, as is the case in our Laos project. But each positive change has far reaching and transformational effects as these communities work together to get themselves out of poverty and drastically improve their living conditions.